I particularly loved this dress because it is so unusual. It's a really classic style, the top half is very flattening (I'm quite petite but between a 10-12 / 38-40 dress size), while the bottom half is very flowing, with a mid-length train. It has quite a vintage feel, and is representative of 1920's design with the top half being of 'ruchon' style. The top half is boned, and was altered to fit me (I'm a 34B/C), however, I also wore a corset. So it is quite loose, but also fits well across the bust. There is lace set around the middle of the dress. The dress is in excellent condition, worn once, then dry cleaned. The dress has four very thin layers, each of different material and a slit down the front from the thigh on the top layer only. The lace is around the neck and there are delicate buttons at the back. There is also a slit at the back of the dress, which you can see on image no. 7. 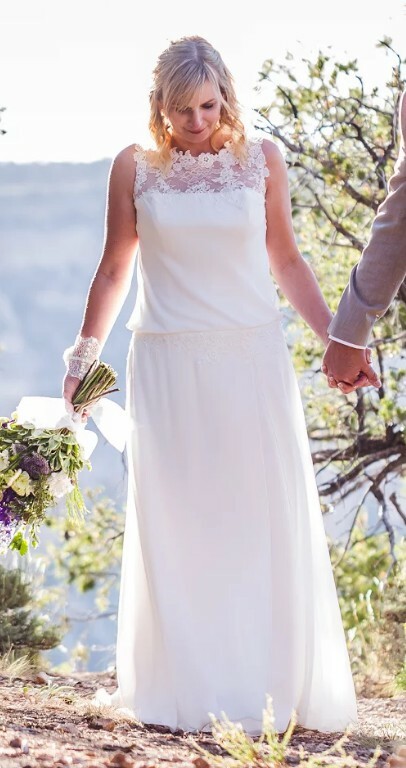 I really loved the style of this dress, really comfortable to wear (I hiked a little up the Grand Canyon in it)! I am based in Den Haag if you wish to view / try on the dress. I did have the dress altered, particularly to accommodate my height. I am 158 cms and I wore 3 inch heels and the dress still touched the floor and you weren't able to see my feet. I see have all of the offcuts from the dress which can be used for the bouquet or other arrangements, as I did not use them.